State of the art technology meets gentle, compassionate care. Services range widely from prophylactic pet wellness to elective and emergency surgical procedures. In addition, SVH utilizes a number of highly sophisticated diagnostic and treatment modalities currently unavailable at local hospitals. Stockton Veterinary Hospital offers on-site cancer care which is provided by our board-certified medical oncologist, Dr. M.J. Hamilton. Dr. Hamilton sees patients at SVH every week on Thursday mornings. This service allows pet owners to receive specialist care at our convenient location without the need to travel to a specialty hospital. Dr. Hamilton and his technicians bring years of experience in pet cancer care to our hospital. Oncology services offered include immunotherapy, chemotherapy, cancer pain management, quality of life enhancement, cancer diagnostic testing and radiation therapy screening. During your consultation, Dr. Hamilton reviews your pet’s prognosis, treatment options and provides a treatment plan customized to your pet’s needs. 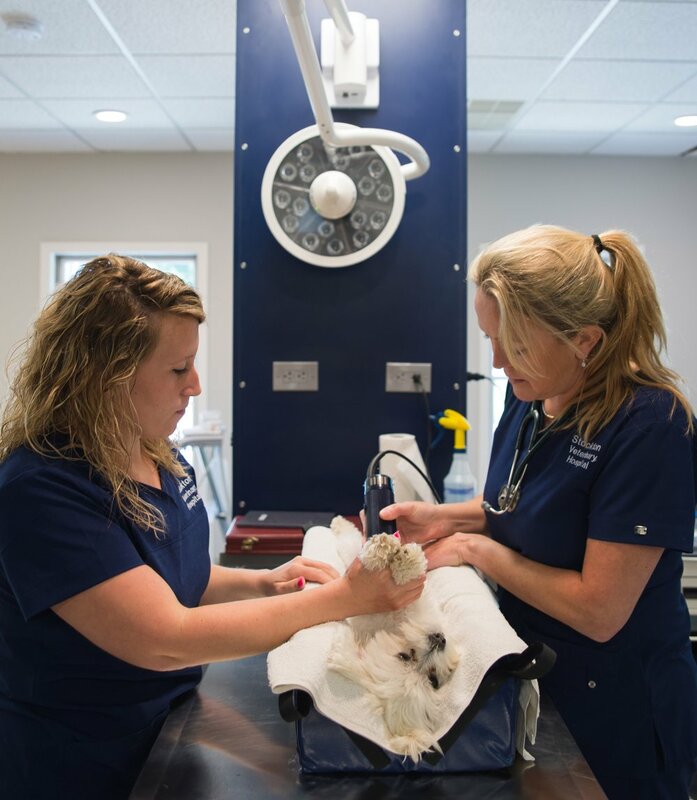 Our Surgical Suite is fully equipped for Veterinary Surgery from routine elective surgeries to more complex. We use human medical grade anesthesia equipment, including Pulse Oximeters, ECG’s, Blood Pressure Monitoring, temperature probes and fully qualified Veterinary Technicians to ensure only the best of care for our patients. Dr. Dennis Ting is board certified by the American College of Veterinary Surgeons. He has particular interests in orthopaedics, traumatology, and oncologic surgery. He is trained in minimally invasive surgeries such as fluoroscopic-assisted fracture repair. Dr. Ting has published a number of original orthopaedic articles in various veterinary journals and has presented numerous lectures on international, national and local levels. He remains active in veterinary continuing education and is a leading instructor in veterinary orthopaedic courses. 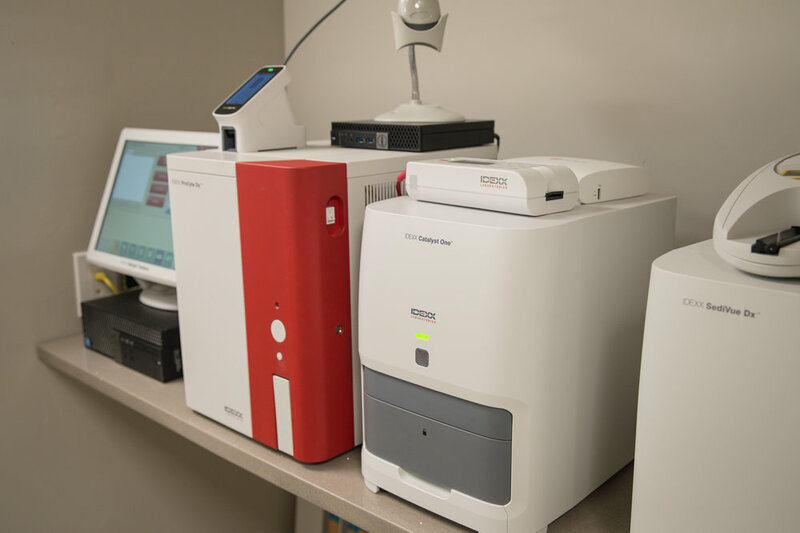 We have a full suite of “In-House” laboratory machines, powered by Idexx Reference Laboratories. This includes a blood Chemistry Analyser, A Procyte CBC machine, Sedi-Vue Urinalysis Machine, a Cytology Lab, State-of- the-art Digital Radiography Suite and Veterinary Ultrasound. If more complex blood tests or Cytology are required we use Idexx Reference Laboratories, the number one laboratory provider for Veterinary Medicine in the USA. The health of your pet is of utmost importance to you and to us. We offer a wide range of wellness and preventive care services including physical exams, vaccines, vaccine titers, routine blood work screens, and much, much more. Our caring staff would be happy to discuss all of the options with you. Our philosophy is that our patients must be healthy and happy. Dental care is a very important part of this. We use State-of- the- art dental equipment and procedures in order to always achieve this goal. We perform Progesterone assays and Vaginal Cytology to assess timing for breeding, Artificial Insemination, Pregnancy Ultrasound or radiography, and should the need arise, Cesarean Sections. With Doctor Charlie’s long term experience with Bulldogs, c-sections are a common procedure. Every patient is an individual. Therefore, no patient ever fits the textbook definition of an illness or injury. That makes Stockton Veterinary Hospital different. Every appointment, every test, every discussion is tailored to your pet, from wellness visits to endocrine disease to everything else.